There are many reasons why the moose is one of our favorite game animals to hunt. Years ago, on a sheep hunt in Alaska's Wrangell Mountains, we were far up on a treacherous slope, nothing but jagged rocks. The nearest scrub timber was a couple thousand feet below&apos;¦and miles away. On a little bench near the top we found the skeleton of a mature bull moose, antlers still attached to the skull. No horse could get up that mountain, but somehow that moose did, and he died there. I've wondered ever since what he was doing. Perhaps trying to escape wolves, but you just never know with moose. The moose is the world's largest deer, genus and species Alces alces. It is hardly a North American animal; in numerous races and varying sizes, the moose circumnavigates the globe in the Northern Hemisphere. Fossil evidence suggests moose crossed from Asia on the Bering Strait land bridge during the late Pleistocene, as recently as perhaps 12,000 years ago. Typically, creatures of both deciduous and boreal forest, moose remain plentiful in Scandinavia and extend eastward across Russia as far south as Mongolia's northern forests. European moose are smaller, with size increasing across Russia to Siberia. While we think of our Alaska-Yukon moose as being the largest of all, the moose of Siberia's Kamchatka Peninsula, just opposite Alaska, are also giants. In North America moose gradually decrease in size from west to east and also from north to south: Eastern Canada moose are smaller than western Canada moose; smallest of all is the Shiras or Yellowstone moose of the northern Rockies. It takes patience, but some of the best opportunities for moose lie in permit draws. Boddington drew a tag for this Colorado bull in 2009. I have never lived in moose country, so I freely admit that my experience is limited, but I have taken multiples of our three North American moose. Or, if you choose to split eastern Canada from western Canada as SCI does, our four North American moose. Either way, I have extras, but not a bunch. I have been fortunate to draw Shiras moose tags in both Colorado and Wyoming, and although it took a few tries to get a shot at a decent moose, I had some wonderful hunts in Newfoundland. Without question, however, my most memorable moose hunting experiences have been in Alaska. The point can be argued, but in the Boone and Crockett record book all but three of the top 20 moose came from Alaska; two from the MacKenzies of Northwest Territories and one from Yukon. In SCI's book, 18 of the top 20 came from Alaska; two from Yukon. None of my moose have approached the top of any book, but I will never forget glassing a marvelous bull bedded in thick alders below a little ridge. He was only 350 yards out, so we discussed the shot. I had a then-new .416 Remington, and despite the size of a moose, I had no idea where to hold at that distance. So, we stalked, and we stalked, and we couldn't find the moose. Assuming he had moved, we returned to the ridge&apos;¦only to glass him sound asleep in exactly the same place. So, we tried again, this time taking a compass bearing. Yep, he was there. He got up at maybe 10 yards. My best moose, you bet, but also my worst packing job. It took three days to get the whole moose — antlers coming out last — back to the airstrip. The moose is primarily a browser, but feeds on aquatic plants as well as terrestrial. Moose generally live near water, whether lakes or rivers, which are insect-infested during warmer months. They will wade or swim far out into water, perhaps to avoid bugs, and, when feeding allows, will also climb very high (which is another explanation for that skeleton I found). Moose are mostly solitary, the only significant bond being between mother and calf. However, it is not uncommon to see several together during the September — October mating season and again in the winter when moose group in valleys and create "yards" where they tramp down the snow and gather for feeding and mutual protection. Gestation period is about eight months, with one and sometimes two calves born in May or June. Bull moose shed their antlers in early winter and start to grow them again in early spring, generally losing their velvet in September. The rut starts soon, and no other antlered animal is as unpredictable during the rut. Moose are not exactly dangerous (more to themselves than hunters), but bull moose are crazy-stupid during the rut (and cow moose are dangerously protective of their calves). Incidents of moose challenging trains are well known, but in this case the moose always loses. In Newfoundland, with a good road network and a lot of moose, the moose often wins a Pyrrhic victory and is a leading cause of highway fatalities. There are lots of moose across Canada and into Alaska. Newfoundland offers some of the least expensive guided hunting, but Alaska is just about the only place where an unguided nonresident can hunt moose, and although the population is currently declining, Alaska still holds a lot of moose. Except: Get in the draws and stay in the draws for Shiras moose. Guided or unguided, with tag in hand your chances are very good. Moose herds across North America increased through about 1990 and have been in a slow decline since. No one is willing to commit to exactly why — perhaps an increase in wolves — but there are still over a million moose in North America and more in Eurasia. Alaska's population is 200,000, and Canada's is between 500,000 and a million. 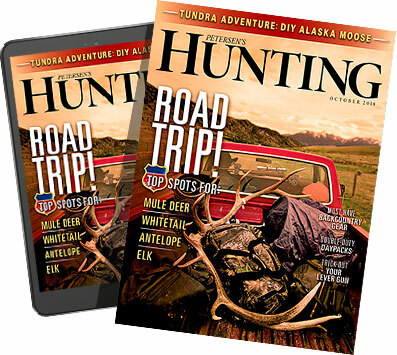 Guided hunts in Alaska and Yukon are expensive, where the value of big moose has escalated dramatically in recent years. Unguided hunts in Alaska — just be careful and plan well. The moose are there, but do you have the knowledge, expertise, and stamina to hunt effectively and then pack your moose out. Guided hunts from Newfoundland west to Alberta are much less expensive than for the giants in Alaska, Yukon, and western Northwest Territories. Potential size is smaller, but average success may well be higher. "Moose" comes from a Native American word. In Europe moose are called "elg," which became our word for "elk." Moose often feed on underwater plants. In a canoe or stalking along a lakeshore you can often see them submerged up to their massive ears and float or walk right up to them. Sweden has the world's most dense moose population, 300,000 to 400,000 and also the highest harvest, up to 150,000, exceeding the entire North American harvest.